Philadelphia District Attorney Larry Krasner ousted 31 members of the office Friday, a dramatic shake-up and the first major staffing decision announced by the city's new top prosecutor, just three days after he was sworn in. 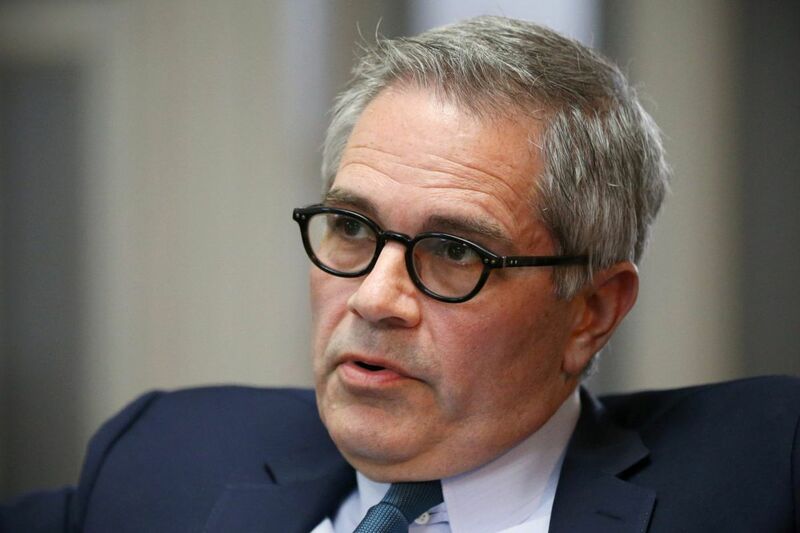 Krasner's spokesman, Ben Waxman, said the dismissals were part of a "broad reorganization" of the office's structure and a way to implement a culture change in an institution Krasner frequently criticized during the campaign. In seeking their resignations, the new district attorney "thanks them for their service to the city," Waxman said in a statement. "However, he made clear his intention to take the office in a different direction." The sweeping change affected lawyers of all ranks and could represent a 10 percent reduction in the number of prosecutors. Names were not released, but current and former employees — none authorized to publicly discuss the moves — said the group included trial attorneys and some supervisor-level staff, many with decades of experience. As many as a third of the office's homicide prosecutors were asked to leave, sources said. The announcement was the first bombshell in what some of his supporters have hoped — and his critics have feared — would be a wave of drastic changes accompanying the installation of the career civil rights lawyer to the city's top law enforcement job. During his campaign, Krasner pledged to reduce the number of people behind bars, never use the death penalty, and seek to end use of cash bail — goals that earned praise from fellow Democrats and liberal criminal justice observers, but skepticism or even scorn from other law enforcement officials. After his victory, Krasner reiterated his priorities but downplayed concerns about a possible exodus or mass purging of staff. He wasn't available for comment Friday, and Waxman declined to elaborate on reasons behind individual dismisals. He did say Krasner was in the office during the purge, even though it was officially closed due to the weather. Some of those let go, who asked not to be identified in discussing their termination, said they were told Friday morning to come to the office as soon as possible. When they arrived, they said, they were escorted by the office's detectives as they learned their fate — often without explanation — and cleaned out their desks. Several left in tears. "This was done in darkness," said one dismissed veteran. Andrew Notaristefano, a homicide prosecutor and District Attorney's Office employee for more than a decade, said he had a homicide trial scheduled to start Monday — and that he'd met with the victim's family Thursday night to prepare. He was at his desk working Friday when a human resources employee took him aside and told him he was fired, he said. Notaristefano, who secured dozens of murder convictions during his career, said he was given "no explanation." He requested to leave after prosecuting his upcoming trial but was told no, he said. His request to speak to Krasner was also denied, he said. "I've worked very hard and sacrificed a lot to make this city a safer place and to help people," said Notaristefano, part of the team of prosecutors that unsuccessfully sought the death penalty last fall in a retrial for a decades-old murder. That case was dubbed the city's "last death penalty case," given Krasner's opposition to capital punishment. Michael Barry, deputy of the pretrial division, confirmed that he was asked to resign, with his last day next Friday. James Carpenter, chief of the Family Violence and Sexual Assault Unit for the last six years, said he was given the same last day. Derek Riker, chief of the Diversion Courts Unit for the last five years, said he was shocked to be let go because "I consider myself one of the progressive people in the office," responsible for cases that involve alternative treatment and programs instead of incarceration — the types of ideals Krasner campaigned to expand. Gwenn Cujdik, a homicide prosecutor, asked what would happen if she didn't resign as requested. She said she was told she would be fired on Monday. "A lot of us stayed because we were willing to stay and willing to work for [Krasner] and continue to do what we do," Cujdik said in a brief interview, describing herself as "devastated" by her firing. Ed Rendell, the former district attorney, mayor, and governor, said such turnover was not unusual. He said he dismissed about 25 percent of the staff when he took over as the city's top prosecutor in 1978. The District Attorney's Office now employs about 600 people, half of them prosecutors. Without explanations for the dismissals, speculation abounded about Krasner's motives. Some suspected he held vendettas against prosecutors with whom he clashed as a defense attorney. Others thought targets may have been picked due to run-ins with Krasner's onetime peers on the defense bar or his wife, Common Pleas Court Judge Lisa M. Rau, who once oversaw criminal cases. Richard Sax, a longtime homicide prosecutor who retired last year, said the dismissals appeared "personal and vindictive," and would cause lasting damage to the office. "Even if he wanted to institute changes into the core of the system, these people would've been instrumental in helping him do that," said Sax, an outspoken critic of Krasner during the campaign. Lt. Philip Riehl of the Philadelphia Police Department's Homicide Unit said: "These career prosecutors were dismissed in a classless and callous manner… The entire system lost today." In his statement, Krasner's spokesman said the new district attorney "was given a clear mandate from the voters for transformational change. Today's actions are necessary to achieve that agenda." Bert Elmore, a veteran defense attorney who said he served on Krasner's transition committee, said the terminations should not be a surprise. "If Larry is going to be true to his campaign promises, he's going to change the culture of that office," Elmore said Friday. "To do that you have to change personnel." Elmore said he had been told 14 new people have been hired for the office. Waxman declined to comment on any hires or other staffing changes.